They can scan people from 30 feet away and process 2,000 individuals per hour. Los Angeles will be the first US city to start equipping its subways with body scanners. But the Southern California metropolis isn't using the bulky, slow-operating models that populate US airports: Instead, LA's Metropolitan Transit Authority will deploy portable trunk-sized scanners that can survey people from 30 feet away at a rate of 2,000 individuals an hour. LA MTA will use the scanners, made by Thruvision, in response to threats of terrorism or to scan large crowds heading to protests or sporting events, according to the Los Angeles Times. A spokesperson said they'll cost around $100,000 apiece, use radio waves to pick out guns and nonmetal explosives beneath clothing and highlight them on a split-screen display. They are calibrated to pick out weapons capable of mass harm. "We're looking specifically for weapons that have the ability to cause a mass-casualty event," LA MTA law enforcement chief Alex Wiggins said, per the Associated Press. "We're looking for explosive vests, we're looking for assault rifles. We're not necessarily looking for smaller weapons that don't have the ability to inflict mass casualties." The LA transit authority is also planning to buy another model of body scanner that looks like a tripod-mounted TV camera, which can focus on individuals. 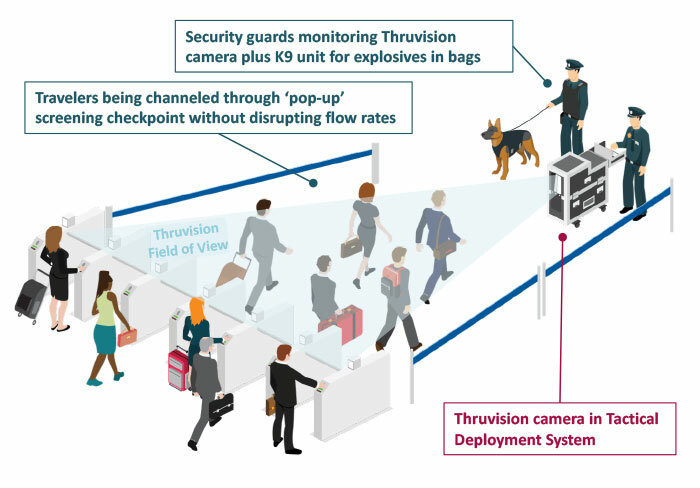 Thruvision's trunk model was approved by TSA for use as a mass-transit scanner in the last year. The agency previously tested body scanners at NYC's Penn Station in February and Union Station in Washington, D.C.